The #8 Seward County Lady Saints wrapped up their non-conference schedule in style Saturday night in the Greenhouse, trouncing visiting Frank Philips 92-53 to improve to 7-1 on the year. 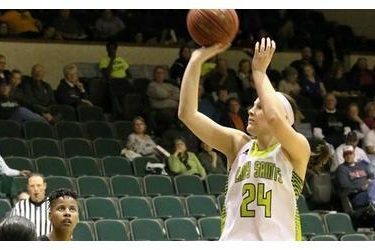 It didn’t take the Lady Saints long to jump on the Lady Plainsmen in front of their home crowd Saturday as Seward bolted out to a 10-0 lead on Frank Phillips just three minutes into the contest. Still up 10 late in the first quarter, a three by Erin Richardson and an offensive rebound and putback by Joanna Grymek staked Seward to a 24-9 advantage after one quarter of action. Seward continued to pound Frank Phillips in the paint as the second quarter got underway. Just two minutes in, the Lady Saints lead was extended to 20 after five straight points from Grymek. Frank Phillips started getting things going on their end, but they simply could not slow down Seward on the other end of the floor. A Seward steal and nifty ball movement turned into an easy look from Axelle Bernard at the midway point of the quarter and Daniela Galindo connected from downtown to make it a 36-13 game in favor of the Lady Saints. Bernard and Grymek took turns putting the ball in the hole for the final five minutes and at the break it was all Lady Saints, leading the Lady Plainsmen 43-22. As they did to start the game, the Lady Saints came out of the locker room at half fired up and ready to go. Seward scored the first 12 points of the second half and just like that it was a 33 point Seward County lead with the Lady Saints up 55-22. With Seward playing a five in, five out rotation, Frank Phillips was able to cut into the Lady Saints lead before the end of the third but Seward still remained up big after three 67-38. The Lady Saints didn’t let off the gas in the fourth quarter, extending their lead to 35 on a rare three pointer from Bernard and a drive and score from Tiani White with 7:14 to go. They took their largest lead of the game with just under a minute left when Erin Richardson connected on a three to make it an 89-50 game and the teams traded triples in the waning seconds of the contest to give Seward a 92-53 victory over the Lady Plainsmen. Seward shot 51% from the field in the win while holding Frank Phillips to just 21% shooting on the night. The Lady Saints owned the painted area, outscoring the Plainsmen 44-10 in the green. For the second straight night, Grymek led Seward, scoring a game high 21 points while Bernard picked up her fifth double-double of the season with a 17 point, 12 rebound performance for the Lady Saints. The win pushes Seward to 7-1 to start the 2015-2016 season while Frank Phillips drops to 4-4 on the year. Next up for the Lady Saints will be Jayhawk Conference play on November 30th when they open their league schedule with a home date against Butler.